Everything they are able to produce on their own, they produce on their own. They mince their meat, they make their own ketchup by their own proper recipe. The potatoes they fry are, of course, homemade and in a certain season you can decide whether you want to enjoy ‘normal’ French fries or those made of blue potatoes. The food’s quality has something to do with its origin too. 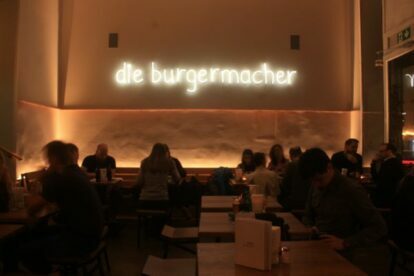 The burger patties are made from meat delivered by small farmers of the region Mühlviertel. The bread ain’t just another kind of bun. It’s from the local organic bakery Schrott. Their food creations vary seasonally, not only the burgers but also the side dishes and salads. Suspecting it already? Right, we’re talking dazzlingly delicious slow food. Also, burgers here aren’t necessarily screaming for meat. There’s a variety of meatless filled buns to be found on the menu. And when they say vegetarian, you are to expect a lot more beyond the normal veg-vocabulary. Try the Sheep Cheese/Hokkaido/Chili-Honey Burger! Tempted to have a bite there soon? Honestly, so are many. That’s why you should make a reservation at least one day before by phone (within their opening hours). Also, they offer take-away. Or, just prepare for waiting a little in the entrance. The owners’ lively spirit and good mood will compensate the wait.